Acute respiratory failure. My breath catches every time I see that on Jax’s hospital admission papers. Jax was admitted on Thursday night after our home pulse oximeter showed his oxygen level was dipping to 81. When we got to the Emergency Department, he was wide-awake and satting 87 (that’s not good). We budded in front of all the other people in the waiting room. There were lots of glares as people questioned why they had to wait and we didn’t. In case this ever happens to you, please be thankful that your child does not need triage attention! We set up camp directly across from the nurses station. Did you know that they save those rooms for the sickest kids? 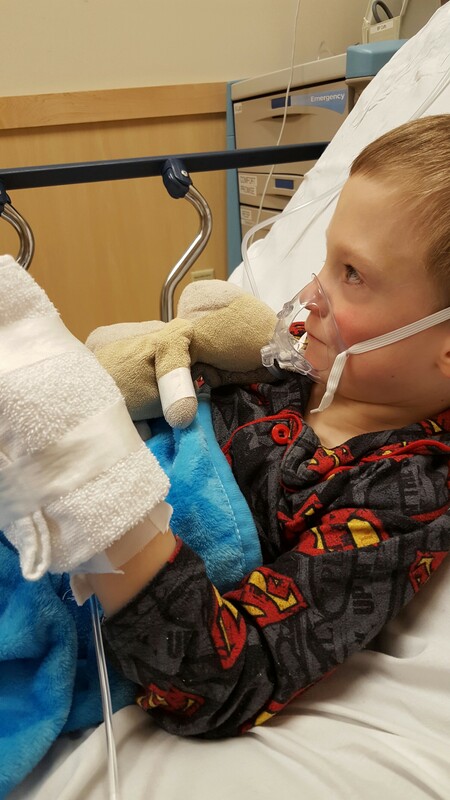 Jax was immediately put on oxygen, but his sats were not improving, so he was admitted. Usually when Jax needs oxygen support, we’re in the hospital for 5 or 6 days. Luckily, he turned the corner quickly and was only there for 2 days this time! Does this mean his lungs are getting stronger? Does this mean we’re getting closer to the right combo of medication? This was Jax’s 6th hospital visit for asthma/breathing issues in the past 12 months. It has to stop eventually, right? The older Jax gets, the harder these hospital stays are on him (and on me). Thankfully, he’s doing a great job recovering at home. The steriods make him completely emotional, so there has been lots of crying and yelling and meltdowns, but he’s also learning how to check in with his body and take deep breaths when he’s feeling out-of-control. Such a a big kid! He is scheduled for hypospadias surgery and an MRI of his brain tumor on Friday, so hopefully his lungs are healed up by then. We already had to postpone the surgery and scan once, so we don’t really want to do that again. But, of course, we’ll do whatever we need to keep Jax safe. He has a pre-op check-up tomorrow, but it might end of being a game time decision. If you have any extra positive thoughts, we’d appreciate it if you sent them our way!